Schematically decomposing the interband transition between a pair of inverted bands into four distinct processes in the uninverted band picture. Processes (I) and (IV) correspond to the interband transitions, whereas processes (II) and (III) corresponding to the effective intraband transitions shall greatly enhance the interband coherence and hence are critical to the strong intrinsic plasmon excitation. 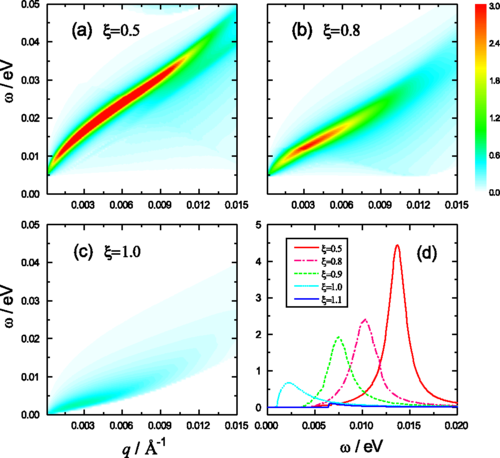 The evolution of the plasmon dispersion in the intrinsic QAH systems of thin films of V- or Cr-doped (Bi,Sb)2Te3Bi,Sb)2Te3 for ξ=0.5=0.5 (a), 0.8 (b), 1.0 (c), respectively. The color bar denotes intensities of loss(q,ω)(q,ω). (d) Plots of the energy-loss function at q=2×10−3 Å−1=2×10−3 Å−1 for different values of ξ. The effective dielectric constant is κ=5=5. Other parameters are the same as those in Fig. 1. Band inversion has led to rich physical effects in both topological insulators and topological semimetals. It has been found that the inverted band structure with the Mexican-hat dispersion could enhance the interband correlation leading to a strong intrinsic plasmon excitation. Its frequency ranges from several meV to tens of meV and can be effectively tuned by the external fields. The electron-hole asymmetric term splits the peak of the plasmon excitation into double peaks. The fate and properties of this plasmon excitation can also act as a probe to characterize the topological phases even in lightly doped systems. We numerically demonstrate the impact of band inversion on plasmon excitations in magnetically doped thin films of three-dimensional strong topological insulators, V- or Cr-doped (Bi,Sb)2Te3Bi,Sb)2Te3, which support the quantum anomalous Hall states. Our work thus sheds some new light on the potential applications of topological materials in plasmonics.